The Asus VG279Q answers the call for a high-refresh 1080p screen that’s based on IPS technology that comes with fantastic viewing angles and color quality. This recent addition to a line of gaming displays that leads the industry is particularly interesting due to its mix of specifications which many have sought after. The Asus VG279Q is a very promising monitor for the masses, but how does it compare to its elite brethren in the brand’s distinguished portfolio? The Asus VG279Q retains the overall aesthetic of the brand’s prestigious gaming line which is simple, yet still attractive for today’s gamers. The matte black chassis has an excellent, easy to maintain texture that doesn’t stain or smudge. The monitor isn’t bezel-free, but there still are 10mm borders on three sides due to the dual stage design. The Asus VG279Q’s build quality and craftsmanship are at a top-notch level even if it sits a lower tier than the ROG Swift displays. The chassis’ edges are clean cut and even throughout thanks to the brand’s excellent QC/QA process. We also didn’t notice any warping or creaking on the monitor when adjusting the display, meaning it should be able to withstand the rigors of everyday use easily. One of the things we love on Asus’ gaming monitors is their modernized control layout which simplifies access to the OSD. The Asus VG279Q doesn’t have a remote, but it does use a multi-directional joystick that’s complemented with hotkeys for convenience. Navigating through the built-in features such as GamePlus is easy as peas and less confusing that most competitors. The Asus V279Q also comes with a fully-flexible stand that offers height, tilt, swivel, and pivot adjustments. The mechanism used is identical to the one found on variants like the PG278QR, so it’s very reliable and doesn’t require replacement. However, you can still opt for a VESA monitor arm if you so desire since the chassis has a 100 x 100 pattern concealed by this part. 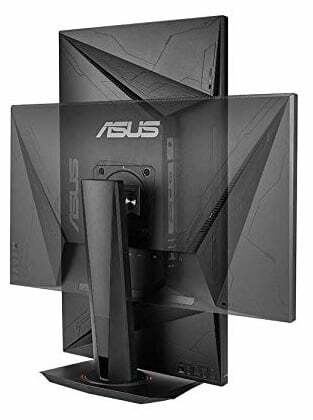 The base on the Asus VG279Q’s stand doesn’t consume a lot of space, but it provides excellent stability for the larger than usual display. There is a red ring at the swivel joint, but it doesn’t light up like on the ROG Swift models. The whole device looks like the latter, but the ROG swag such as badges and details such as LED rings are not included in this iteration. The I/O panel on the Asus VG279Q includes everything you will ever need to utilize the product as an all-in-one display for your devices. The layout includes a port each for DisplayPort 1.2, HDMI 1.4, and DVI-DL, but it doesn’t have USB connectors for peripherals. There is a pair of 2-watt speakers, but the audio quality will point you in the direction of a separate set or headphones. The Asus VG279Q sports a 27-inch IPS panel with a 1920 x 1080 resolution, 144Hz refresh rate, and a 3ms response time. It’s worth noting that this variant includes a 1ms MPRT feature to boost its pixel transitions and reduce blurring. The display also comes with a powerful 400cd/m2 backlight and is rated to have a 1000:1 contrast ratio. The first thing users will notice with the Asus VG279Q is its lower pixel density which has a softening effect on images. Lines and edges look less sharp than they are on a 24-inch variant, but this option still has its merits. Some E-Sports gamers prefer the looser pixel pitch since it enlarges distant objects such as opponents heads or limbs, making them easier to see and engage. The Asus VG279Q posts great results in color reproduction using the Racing color filter, covering a little over 99% of the sRGB gamut. Accuracy averages at DeltaE 1.80 which is excellent for a gaming monitor, eliminating the need for difficult calibration. The screen’s color temperature sits perfectly close to the ideal 6500K point, so the screen looks well balanced. This fact makes the Asus VG279Q look good for games, but it could also double as a basic editing display. TN and VA-based options usually struggle in this aspect, making them less ideal choices for numerous users. The backlight on the Asus VG279Q is quite potent since it can reach a maximum of 460cd/m2. Unfortunately, it does little to help the display’s contrast which maxes out at 850cd/m2. That score is still decent, but we’ve seen new models that can reach as much as 1200:1 for better range. Gamma is also affected since it tracks at 2.08 which makes the screen lighter than we’d like. These numbers make blacks appear grayish, and some dark colors look washed out, especially in dark titles such as the Division 2. Well-lit titles like Apex Legends are less affected, but there are some instances where these flaws can become noticeable and irritating. The panel uniformity on the Asus VG279Q test unit isn’t as good as we had hoped, but that’s expected from an IPS panel. There are slight leaks on the corners of the screen which affected black uniformity, but it isn’t noticeable when in-game sequences are at play. Take note that this characteristic can vary from unit to unit since no two modules are made equal. The Asus VG279Q handles motion with aplomb, so we don’t think most users will even utilize its overdrive features. Blurs and image retention aren’t included as issues in the display’s performance which is fantastic considering its an IPS variant. If you have extra sensitive eyes and notice these flaws in games like CSGO, you still have the 1ms MPRT feature to clean the image further. 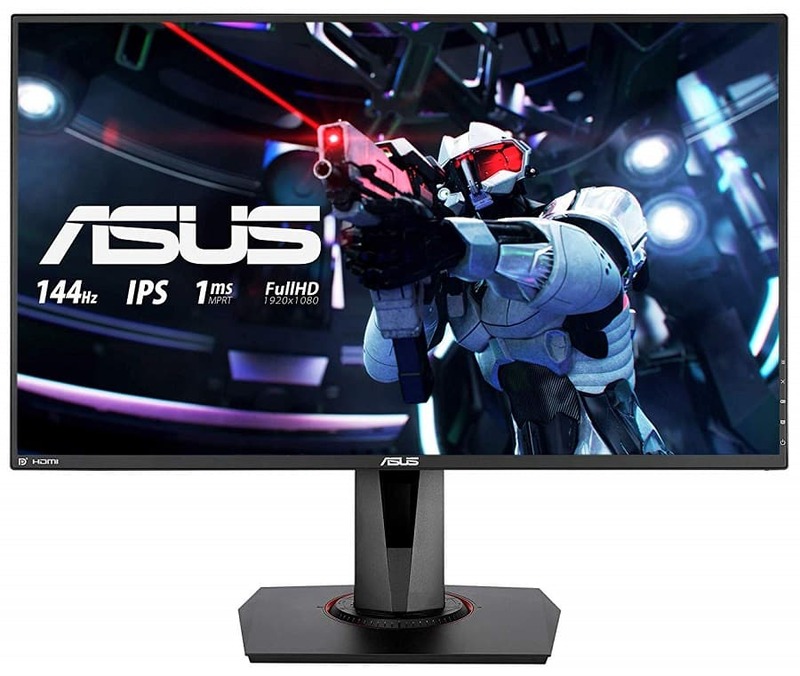 The Asus VG279Q is a FreeSync gaming monitor with a functional range of 40Hz to 144Hz which makes it suitable for AMD GPU users. It’s also listed and certified as G-Sync compatible, allowing the majority who own Nvidia users to join in on the fun. Input lag is limited to 10ms, so there are no delays and “de-synced” instances when using this gaming display. The Asus VG279Q is an excellent gaming monitor for its price, thanks to its accurate IPS panel. A 1080p 144Hz IPS monitor has been a part of many wishlists we’ve come across, and we’re glad Asus answered them with a decent option. This model performs just as good as its premium-tiered siblings, ensuring that it will sell well in the market. The only glaring issue of the Asus VG279Q is the limitations presented by its IPS panel such as the low contrast ratio. The screen looks grayish or slightly washed out in some instances compared to TN and VA variants we’ve tested. But other than that, the monitor is a fantastic choice if a 1080p gaming variant with excellent viewing angles is in your shopping list.